Filmland Classics :: > Private Collection Sales :: Classic Horror/Sci-Fi DVDs - Factory Issued - Only $1.99 each! 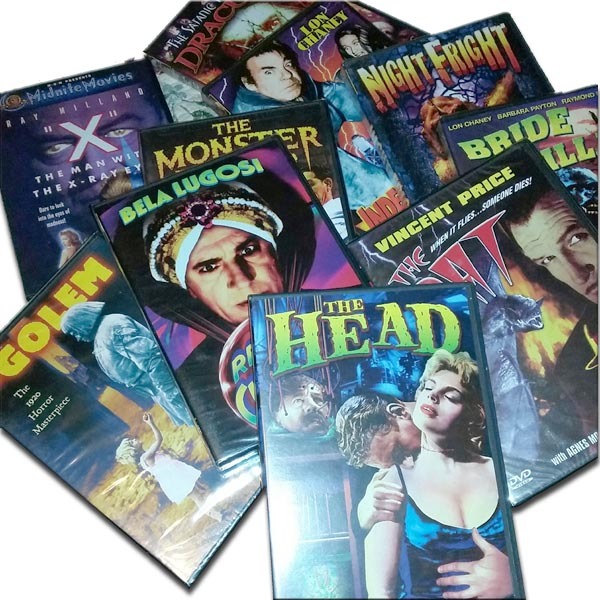 > Private Collection Sales Classic Horror/Sci-Fi DVDs - Factory Issued - Only $1.99 each! Dozens of classic titles. Some famous. Some obscure but all terror-ific blasts from the past. All DVDs are brand new factory issued copies in mint condition. All DVDs come in hard plastic display cases with graphics. Some shrink wrapped, some not but all new/mint condition. Photo above is representational of the items. Select first title from the drop down list above and click "add to cart". Return to this page, select additional title, click "add to cart" and repeat for other items. Only 1 copy of each title is available. 2 copies will ship in a PM flat.